How do I get to the Creston? From Highway 41, turn South on Highway 229/Webster Road for 1 mile to Creston. Can someone else check-in for me? NO, all riders must check-in in person and show a photo ID. When do I receive my registration materials and any clothing I ordered? When you check-in for the ride. If you do not attend the ride, your clothing will be mailed to you. Note: Try on clothing when you pick it up to make sure it fits correctly. It may be exchanged at clothing sales for another size if we have it in stock. What is the Spaghetti Feed? Friday night you can take part in the annual Spaghetti Feed put on by the community to benefit the Creston Women's Club Scholarship Fund. What is the Parking situation in Creston? There is very limited parking within the small town of Creston and no parking at the Creston Elementary School. 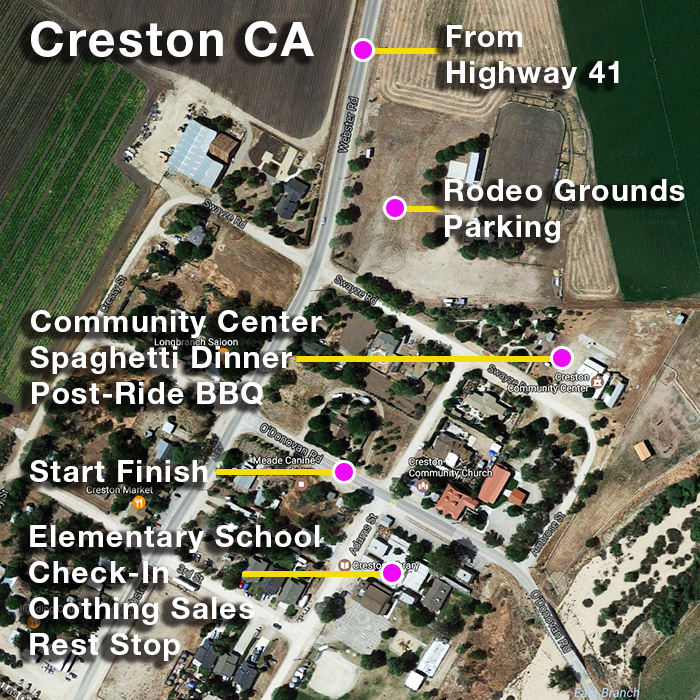 There will be parking at the rodeo grounds on the left as you enter Creston. Once the rodeo grounds are full, there is parking along Highway 229 as you approach Creston. We encourage you to use car pooling as much as possible. Wherever you park, be sure to be off the roadway pavement. Where are local bike shops located? Click Bike Shops for a list. Atascadero has the closest shop followed by Paso Robles. Some shops have a range of bikes for rent. What does Paso Robles Wine Country have to offer? Discover information on Wineries, Restaurants, Lodging, Events and Tours at the Paso Robles Wine Country website. How do I find area motels and hotels? Atascadero is the nearest city (13 miles) and provides several lodging choices including the historic Carlton Hotel. The Paso Robles Wine Country's Lodging webpage provides links to a variety of area options. The following links take you to the lodging pages of the respective Chambers of Commerce websites. What are the camping options in Creston? RV Camping: There will be self-contained RV camping available on a first-come first-served basis at the Creston Community Center. Call Bruce Hebron of the Creston Volunteer Firefighters Association at 805-238-1662 for information. Tent Camping: There will be tent camping on the Creston Elementary School grounds. Bathrooms but no showers will be available. Call the school at 805-238-4771 for information. Where is the closest full service camping? The Santa Margarita KOA is located 18 miles/30 minutes from Creston on Loop 2 of the Century route. It provides both tent and RV sites with access to rest rooms and showers and deluxe cabins. What is Granite Ridge near Creston? The Granite Ridge Christian Camp is located 6 miles/10 minutes from Creston. The Lodge at Granite Ridge has 8 rooms that sleep up to 4 people and a large community space. A continental breakfast is included and all rooms are equipped with linens and the bathrooms are supplied with towels for each person. The cost is $35 per person/bed a night and rooms can be shared or private. To make reservations call 805-238-3582 or email camp@graniteridgecamp.com. The weather is usually cool in the morning, but it can turn hot by the end of the day. Check the Creston Weather forecast. The ride will be held rain or shine. When should you start your ride? The course opens at 7:00 AM. If you start early, you will find the rest stops closed. Rest Stops assume riders average less than 15 mph. Use the following start times to support your enjoyment and successful completion of the ride. Note: The course closes at 5:00 PM. What drinks and food are provided at rest stops? The food and drinks at each rest stop are selected to both nourish the body and taste great as you ride the course. Every rest stop has an appropriate selection of carbs and protein from which you can choose. Drinks will include Fluid sports drink, fresh lemonade and water with coffee at the first stop. Standard rest stop food will include such things as locally made cookies, bagels, bananas, oranges, PB&J sandwiches and hard boiled eggs. This will be expanded with unique additions at each rest stop to support rider needs and provide variety. There will be gluten free options. Note: If you use energy bars, chews, gels, bloks, etc. at or between rest stops based on your physical needs or diet, please make sure you have them with you. Note: Rest stops close based on riders being on schedule to complete the course by 5:00 PM. What services do SAG Units provide? Offer riders on the course after 5:00 PM transportation to the finish. Riders who turn the offer down are on their own. Where will bike mechanics be located? There will be bike mechanics at the start in Creston and at most rest stops. What about the Post-Ride BBQ? The menu includes barbecued chicken, salad and dessert. Drinks will include ice tea, sodas and water with local beer and wine available for purchase. Extra post-ride BBQ tickets for non-riders can be purchased at the event for $12.00. Are E-Bikes allowed at the event? Electric bicycles (E-Bikes) are allowed if they are pedal-assisted, Class 1 or Class 3 E-Bikes, which meet the specifications provided below and are consistent with California and Federal Law. Riders of E-Bikes must follow the rules established for e-bikes within the California Vehicle Code. This includes following the rules of the road that apply to standard bicycles and e-bikes and the safe cycling practices set forth for the event. An E-Bike is a bicycle equipped with fully operable pedals and an electric motor of less than 750 watts. A Class 1 E-Bike is a bicycle equipped with a motor that provides assistance only when the rider is pedaling, and that ceases to provide assistance above 20 miles per hour. A Class 3 E-Bike is a bicycle equipped with a motor that provides assistance only when the rider is pedaling, and that ceases to provide assistance above 28 miles per hour. What support are E-bikes provided? No support unique to E-bikes is provided. It is the responsibility of the rider to carry a battery sufficient to complete the chosen route – there are no charging stations provided. All SAG vehicles may not be able to transport e-bikes due to their weight or size. Riders must be able to pedal their bikes back to the start. Where can I find event stats and photos taken during the ride? Go to PhotoCrazy for event stats and photos. Use your RFID number to easily find your photo. How should I post and tag my event photos? Follow us on Instagram and add #slobcwildflowercentury and #slobc to event images you post during or after the ride. See what others have posted. How do I check to see if something I lost was found? Before you leave Creston, check with Lost & Found at Net Control located at the Creston Elementary School. You can also send an email to information@slobc.org. Provide a description of the item and your address. We will respond as soon as possible.